Houses & Homes VA: What exactly is a loan “pre-approval” and why is it important? What exactly is a loan “pre-approval” and why is it important? 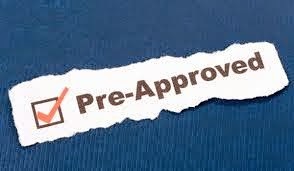 Many times over the years I have been asked by clients to explain what a “pre-approval” is and if it is necessary. Being pre-approved for a loan simply means that a lender is willing to give you a home loan based on your credit history and income. It is a “promise” from the lender stating that you are in fact qualified to borrow up to a certain amount and that they are willing to grant you the loan provided that there are no drastic changes in your financial stability (such as job loss or reduced income). Provided that all is well you will be provided with a pre-approval letter stating that your home loan will be approved once you make an official offer on a home. After making an offer to purchase there is much more documentation required on your part in order to actually obtain the loan including the purchase contract, financial documentation (verifying your income and assets), an appraisal of the property and other documentation as well. It’s important to note that pre-approval is not a 100% guarantee that you will be approved once you make an offer on your dream home. At this time the property has not been appraised and if its value is determined to be less than your offer the lender will naturally refuse financing. It’s also important to be aware that your loan representative is not the person whom will actually approve your loan. After making an offer a loan underwriter will process the loan request and will require additional documentation including W-2’s, previous tax returns and more. This is when your actual approval will be granted or denied. There are usually 4 possible answers that the borrower will receive from the underwriter. They are either approval, approval with conditions, suspended (meaning that more information is required to make a final decision) or denial. Being pre-approved is very important in the home buying process because it tells everyone involved that you have the financial means to buy the home and that no one is wasting their time and energy for no reason. This, of course, is completely understandable. Remember, you may not be the only party interested in buying a particular property and usually the seller is eager to sell their home as soon as possible. Many times offers made by persons without pre-approval may not be taken seriously or rejected all together by the seller. If you are serious about buying a home than getting a pre-approval is your very first step and should be completed before you even begin your search.